If you are following my blog entry then you will know that I'm making cute characters from San-X for this week and next week bento. I have chosen Homekoro for today's bento. HOMEKORO is a cute and fluffy pomeranian who is good at compliments and his favorite food is croquette. Uttori (little bird) is Homekoro's best friend who is enchanted and riveted by praise. Apparently the pink hair is Uttori's pride. Homekoro always gives Uttori a lot of praises. Inside the box : carrots, broccoli, corns, medallion pork cooked with mushroom and oyster sauce, and flower shapes sweet purple potatoes & potato. Homekoro was made of rice ball shaped by hand, covered with hana katsuobushi. Uttori was made of quail egg. Love your San-X theme Lia, can't wait for tomorrow's bento! Just WOW! This is so cute, I want to run out right now and buy everything to try it myself! This is just so adorable and fluffy! *_* It's just too cute to eat it! <3 <3 <3 Your so creative! @noobcook : If we live in the same city then I will send bento everyday and trade it with your delicious cooking LOL :D Thanks Wiffy! @Fluteloop : Hahaha ... I want to try your bento style, so we exchange the idea :) Thanks a lot for the nice comment! @Token : Thanks a lot for the kind words! I learn a lot from many great bento maker. The pink hair of the Uttori is really outstanding from the bento, cute! I love those cutters you used to create the flowers. I guess I am just longing for spring to come. The character you made is so cute. I'm not familiar with it. Is it a cat? I love the little chiken too. The port sounds delicious. @allingoodfood42 : Homekoro is a pomeranian (dog) hehehe ... Thanks a lot Marisa for your wonderful comment! lia, you have to tell me what hana katsuobushi is - i have never heard of it but it does the fluffy fur so well! the flowers in this one are so pretty too. i love your san-x creations! @megan : Hana Katsuobushi is written on the pack that I bought. It is actually smoked skipjack tuna flakes. Find out more about KATSUOBUSHI. I am sure you know it when you see the picture ;) Thanks a lot Megan! fom San-X??? Please let it be Monokuro Boo and Baby Boo-s!!!!!!!!! I love those characters!!!!! nice, like the chick best :) Not too familiar with characters from San-X so its been interesting. Super cute!!! Can't see what other characters you do! nice bento! love all the bright colors... is the pink komaboko??? aww the homekoro is so cute! 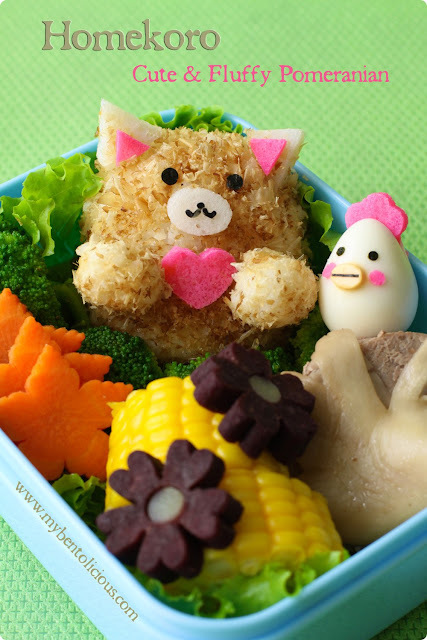 I don;t think I can ever eat these bentos, they are just too cute!